Get Fundamental training in a variety of Architecture, construction and energy trades. Our programs are designed to prepare students for employment in the various industries of Architecture and Construction; like Carpentry, Air Conditioning, Refrigeration & Heating Technologies, Electricity, Plumbing Technology, and more! Program Length: 1350 hours / approx. 12 months – full time A/C jobs are cool! Instruction includes classroom and lab experiences that enable the student to be job ready and become proficient in the installation, repair, and maintenance of domestic and commercial air conditioning, refrigeration and heating systems. Heavy emphasis is placed on electrical systems. Program Length: 1200 hours Construction is one of the Fastest growing industries in South Florida. 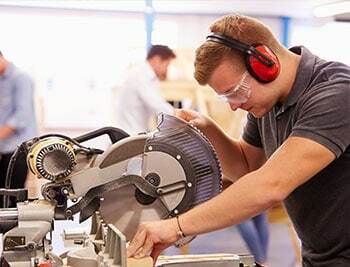 The Carpentry program prepares students for careers in the construction industry. Graduates will be eligible to be employed as rough carpenters doing framing and formwork or as finish carpenters installing windows and doors using hand tools and power tools. Students will also be taught the basics of construction planning, management, finance and production skills. Program Length: 1500 hours Instruction is designed to provide experience in all aspects of this graphic language. Students begin their training by learning drafting principles and techniques using traditional manual drafting boards and tools. Advance to the extensive use of techniques and technology utilized to prepare two-dimensional Computer-Aided Design and Drafting (CADD) work using AutoCAD, three dimensional Building Information and Modeling (BIM) drawings using Revit and advanced mechanical design drawings using SolidWorks. Program Length: 1200 hours Get Plugged In! Learn basic electrical principles, residential wiring, commercial wiring, blueprint reading; installation of conduit, and safe work practices. Program content also includes interpreting national and local electrical codes. Special Note: With additional successful testing, the completion of this program may be used as a substitute for the first year of an Electrical Apprenticeship Program. Graduating students are encouraged to pursue taking the Broward County Electrical Journeyman License exam. Program Length: 60 hours This program focuses on training in plumbing for residential, commercial and industrial systems. Student will be instructed on soldering, blueprint reading, cutting/joining pipes, and interpreting national and local plumbing codes. Also, the students will master the understanding of all aspects of the plumbing industry’s planning, management, finance, technical and production skills.